In the Fall 2018 issue of Canadian Teacher Magazine, Editor Diana Mumford shines a light on a picture book that can be used to teach students about empathy, compassion, and understanding. Although the book I have chosen to highlight in this issue is a picture book, I think it could be used at many levels—from kindergarten to senior students—to celebrate and talk about the “humanness” that we all share. 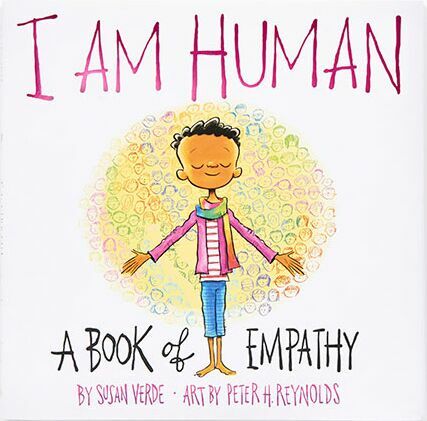 The title is I Am Human: A Book of Empathy by Susan Verde, illustrated by Peter H. Reynolds (Abrams Books for Young Readers, 2018. ISBN 978-1-4197-3165-5). Students of all ages could make personal connections to the concepts presented on every page through the text and illustrations—the possibilities for thoughtful discussion are endless. The narrator points out that he is both unique and just one of billions of people on Earth. Universal qualities like learning and dreaming and choosing our paths in life are influenced by our curiosity and sense of wonder about the world. We are playful and enjoy friendships, but we can be both hurt by, and hurtful to, other people. We are not perfect and can make mistakes, but we can ask for forgiveness and make amends when we hurt others. We can be fearful, but we can be brave and adventurous too. We can be compassionate and have empathy for others, knowing that every other person is also both unique and one of billions of human beings sharing this planet. Understanding that we are all human and all connected to one another is a basic step toward empathy and acceptance—a lesson that, goodness knows, needs to be repeated and reinforced in today’s world. This Letter from the Editor is from Canadian Teacher Magazine’s Fall 2018 issue.